Mario Armstrong Media, LLC is looking for a freelance blogger with a background in small business and entrepreneurship. This blogger is responsible for developing content to help entrepreneurs and small business owners get solutions to their most common challenges. You will be working directly with Mario Armstrong and the social media manager of this project. 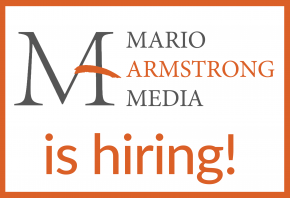 Mario Armstrong Media, LLC is a media company is a very supportive and flexible company that treats team members with the utmost respect, pushes team members to make an impact that they enjoy delivering and gives you significant room for creative independence to launch your ideas. We are based in Baltimore and NYC, however this position is virtual, work from anywhere. This is a CONTRACTUAL position for a 3 month contract to work with one of our National clients. There is the possibility of a long-term extension. Independence: Through the roof, we are an extremely supportive and creative environment. Demonstrable experience writing blog posts or articles for topics relevant to small business and entrepreneurship. Experience writing/blogging about solutions to small business owners common questions. Positive attitude, someone who is looking to make a positive impact to help others be successful. Email your interest with any links.